My experience with ACE exceeded all expectations. I was part of the Shimongwe Wildlife Veterinary Experience, following the highly regarded wildlife Vet, Dr Rogers. It was without doubt the best trip of my life so far. Not only was it the perfect opportunity to help me stand out in my Veterinary Medicine University application but it has given me unforgettable memories and I met many inspiring people.Being only 18 and never having travelled alone outside of Europe I was rather nervous leading up to my trip, however, the ACE team addressed all of my concerns and fully informed me regarding my arrival, transfer and departure. I met Natalie on arrival and she briefed me on all I needed to know and gave me a bit of background knowledge on South Africa and it’s wildlife, before escorting me to my transport which would take me to the host family. The host family were fantastic! The food was amazing and they certainly went out of their way to make me feel at home. The location was unbelievable. It isn’t everyday you swim in a pool surrounded by wild giraffe and zebra! 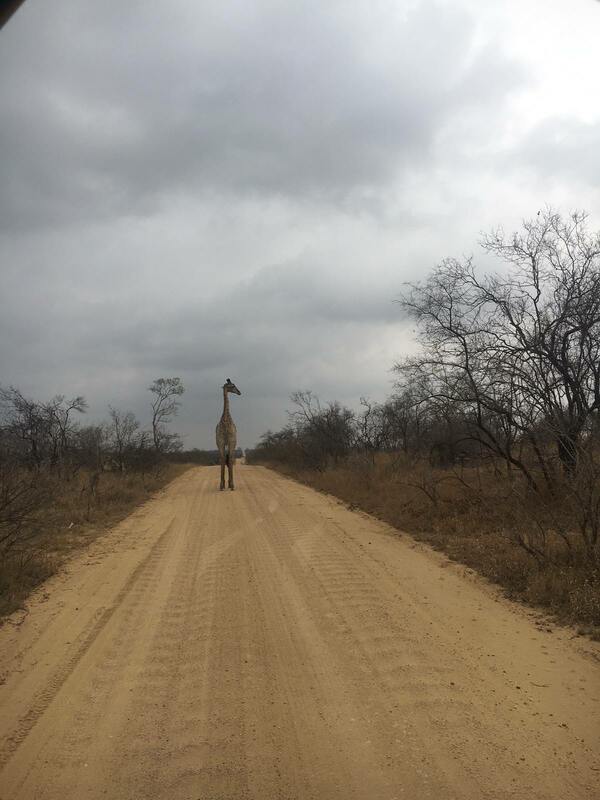 Each day started with the drive to Dr Rogers’ practice which was a brilliant opportunity to witness some of South Africa’s scenery and wildlife. Once work with Dr Rogers had finished we had the drive home which was the perfect time to discuss the day with the family. Evenings were spent in the pool or watching films. It was perfectly acceptable to spend time on your own. I shared my experience with two other volunteers, a vet nurse from the UK the first week and an aspiring veterinary student, like myself, from the US the second week. The first case I witnessed was certainly a very exciting one, a trip to a reserve to administer contraceptives to two hand reared white lions. Watching Dr Rogers work with these magnificent animals was remarkable, he was keen to share every detail of the case with us from the biochemistry of the contraceptives themselves to the impact these lions have on tourism and the livelihood of the reserve owner. 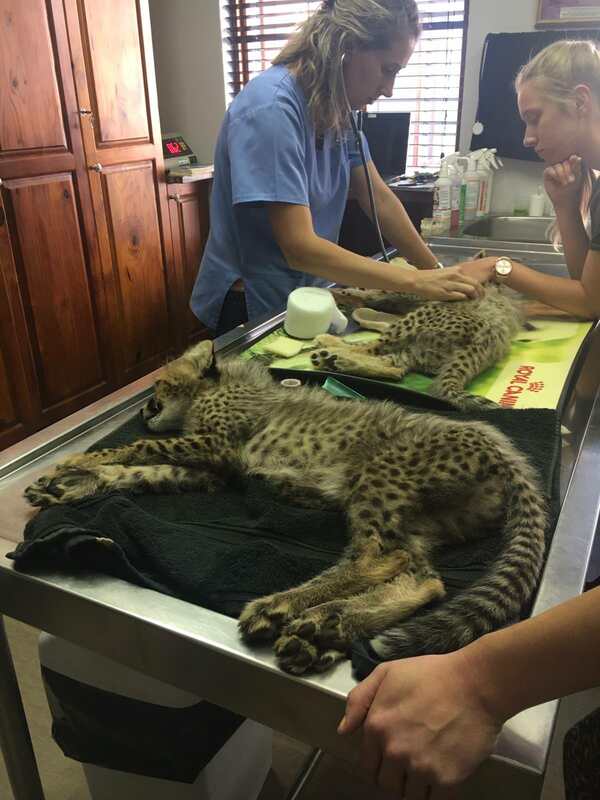 On return to the practice there was a phone call from a local rehabilitation centre who were bringing in four hand reared cheetah cubs, two with suspected fractures and two requiring check ups on previous fractures. 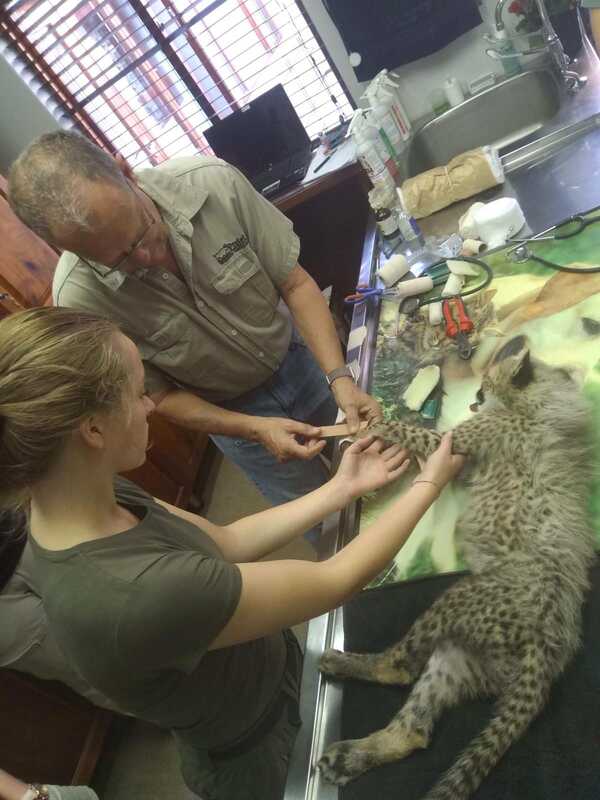 I was fortunate enough to assist Dr Rogers on these cases, holding the cheetah whilst he cast their legs and talked through the X-rays and subsequent prognosis. On my second day there were no call outs so all the work was based in the practice. I witnessed numerous feline neuters, which are essential for my Veterinary Medicine application, alongside an extraordinary case of a dog with pneumothorax and a wing amputation on a rescued Barn Owl. If there were no call outs to the wildlife there was always something going on in the small animal practice. Day three was packed full of fascinating cases. It began with health checks on a cheetah and wild dog from a rescue centre. This was a risky health check, Dr Rogers had concerns regarding the effects of the anaesthetic as these were older animals. It was a valuable experience watching him working under such pressure and seeing his years of experience pay off when the animals fully recovered after the anaesthetic. During these health checks Dr Rogers received an emergency call from a local rescue centre who had received a rhino calf. Unfortunately my first rhino case was rather unpleasant. 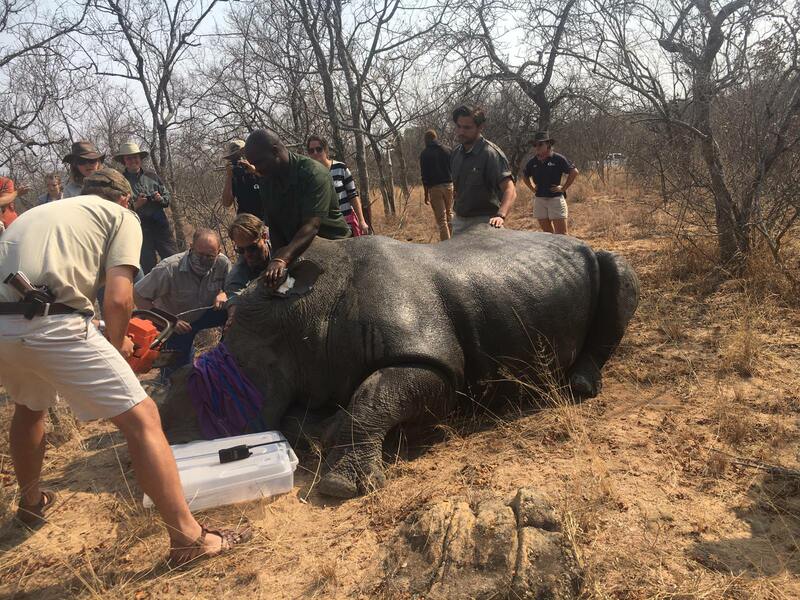 The rhino calf was in very poor condition and the prognosis was bad. Nevertheless, this was a valuable experience witnessing the difficulties and conflicts in conservation, particularly with a species as special as the rhino. 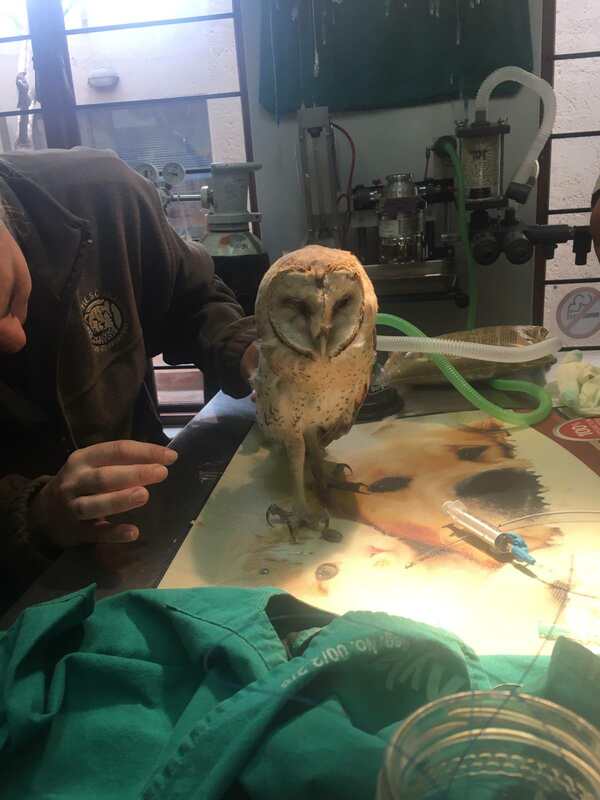 Once back at the practice a tawny eagle arrived having been hit by a car and required immediate surgery. Once again I was lucky enough to assist this procedure with holding the eagle and the oxygen mask in place as Dr Rogers talked through what he was doing. After having a weekend of free time and excursions Monday was an extraordinary day starting with a rhino dehorning. This was one of the highlights of the trip, being up close to a rhino and being part of a massive project to reduce poaching was truly incredible. The experience didn’t really sink in until later that day. The whole operation from the team of jeeps and a helicopter to the paying tourists, rangers and government officials was fascinating. I was fortunate enough to talk to a government official who regulated and oversees wildlife conservation, I learnt a lot about the conflicts Africa’s wildlife has with the changing land uses and the importance of educating the people in an attempt to preserve this wildlife. In the afternoon there was a call out to a cheetah with a broken tooth and subsequent abscess. 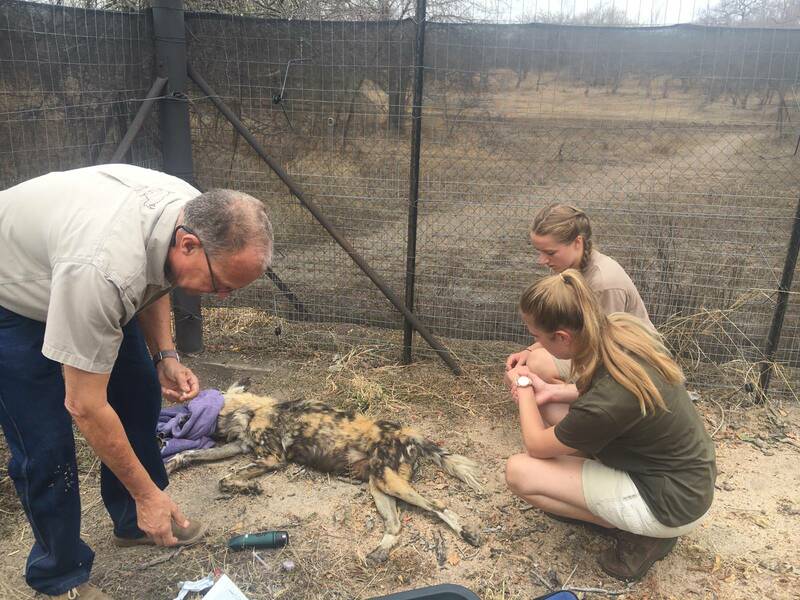 The tooth had to be removed and the abscess drained, Dr Rogers performed this under immense pressure as the intense heat posed risks to the exposed cheetah out in the reserve, when under anaesthetic. Being up close to these beautiful cats was truly wonderful and being allowed to help out in Dr Rogers’ work with them is unforgettable. The following day started with the arrival of a brown hooded kingfisher and a red horn bill, both had injured their wings and legs. The next case involved a trip to check up on a wild cheetah who had recently moved reserves. 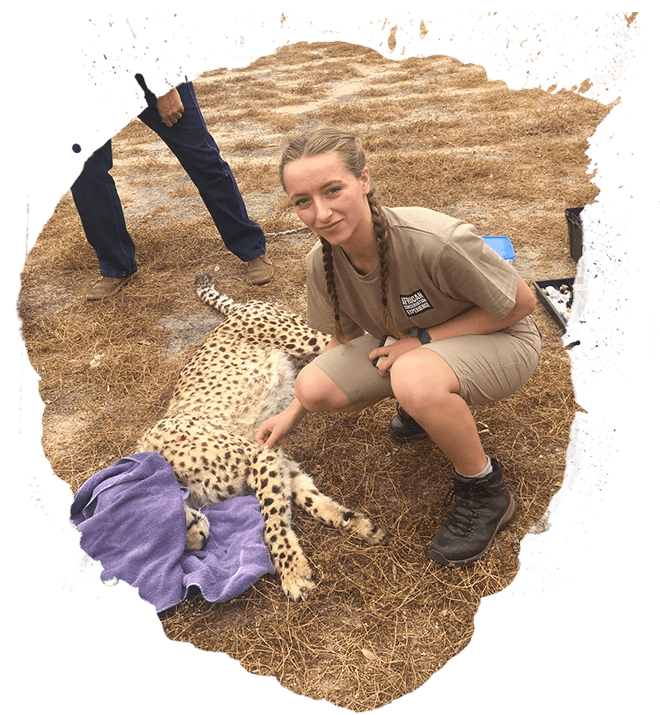 Dr Rogers had previously inserted a GPS tracker into the abdomen of this cheetah in order to monitor her progress in the new location. Unfortunately the cheetah had not settled and the tracker showed no indication of her hunting nor being accepted into the pre-existing coalition of cheetah. Once located and darted it was evident she had been injured by another cheetah, she was underweight and it was obvious she hadn’t learnt to hunt from the analysis of her health and the activity on the GPS. She was given a general health check and her wounds were dressed. 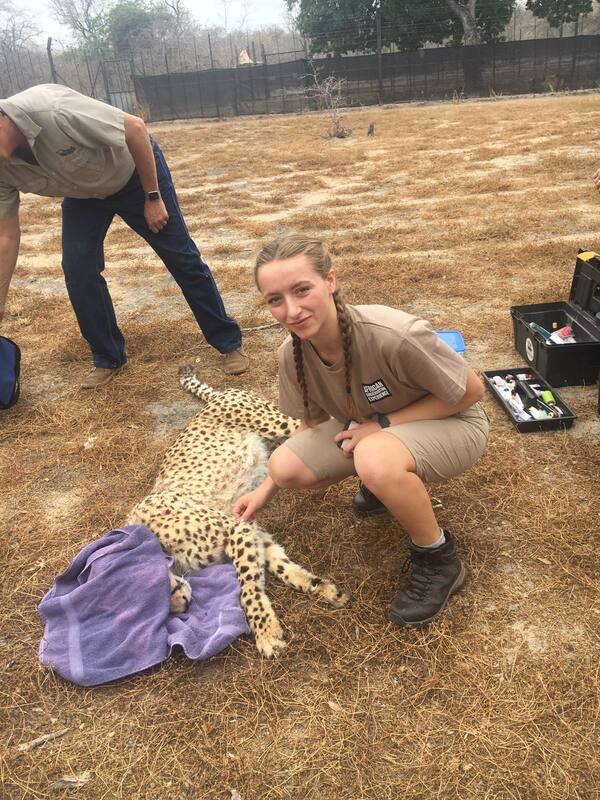 This work required great skill, being in the middle of the Bush with a wild cheetah under anaesthetic in the heat of the day meant she was put on a drip and under intense monitoring. At the practice it was time for the tawny eagle to have his stitches removed and be released back into the wild. As an aspiring veterinary student it was valuable to see the entirety of this successful case and it was rewarding to see him released back into the wild in good health. The variety of species and unexpected emergencies, such as this day, just shows how you never knew what might crop up next or if you’d ever see such close work with some of these species again. Monday was an extraordinary day starting with a rhino dehorning. This was one of the highlights of the trip, being up close to a rhino and being part of a massive project to reduce poaching was truly incredible. The eighth day was an early start to remove a snare from a wild dog. Locating the pack of wild dogs was exciting to say the least. Wild dog cover many miles a day so it took a large team of rangers located all over the reserve to locate the exact spot of the specific wild dog. Once they had been found it was a challenge to spot which wild dog in the pack had to be darted in order to remove the snare. Once she was darted the removal of the snare took no time at all and thankfully no damage had been done. 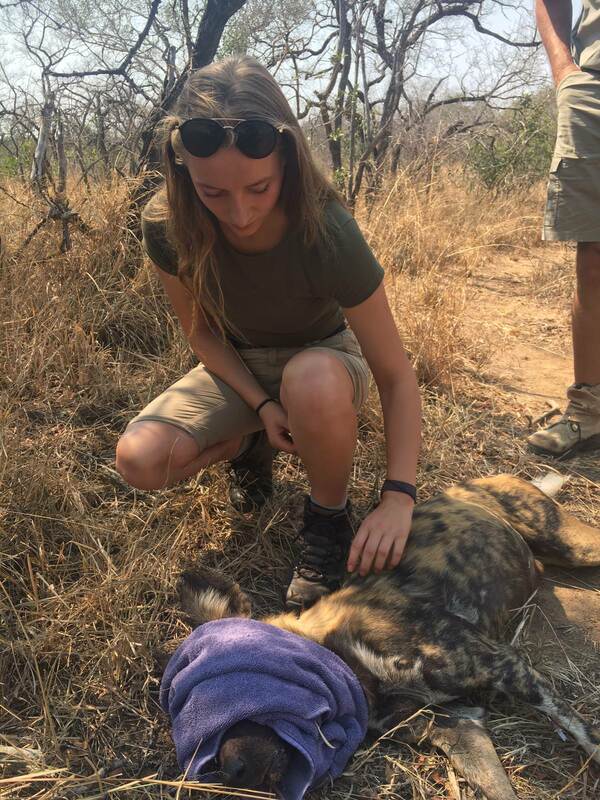 I was lucky to see such a promising case with this wild dog as she was in excellent condition and was pregnant, something very rare but hopeful for the future of this endangered species. The rest of the day was spent watching feline neuters and vaccinating horses against the potentially fatal African Swine Flu. The next day began with X-raying an elephant’s leg, a dangerous procedure on a large bull. He was in a boma (an enclosure) to try and reduce further injury, but there were still many risks with this procedure and so on this occasion the volunteers had to watch from a distance. Dr Rogers still didn’t fail to talk us through the history and potential outcome for this bull on the way back to the practice. The afternoon was busy with a (health check on a pangolin and) a revisit from two of the cheetah cubs who had previously been treated with fractured legs for a check up. A serval cub also came along with the cheetah cubs with a compound fracture. Having the opportunity to assist Dr Rogers’ work with these precious animals was amazing and watching the work of this rehabilitation centre was inspiring. That evening there was a call out to release an elephant caught up in wire. The young bull had his legs tangled in the wire and was unable to walk, he was underweight and distressed. Locating the elephant didn’t take long as he hadn’t moved far. 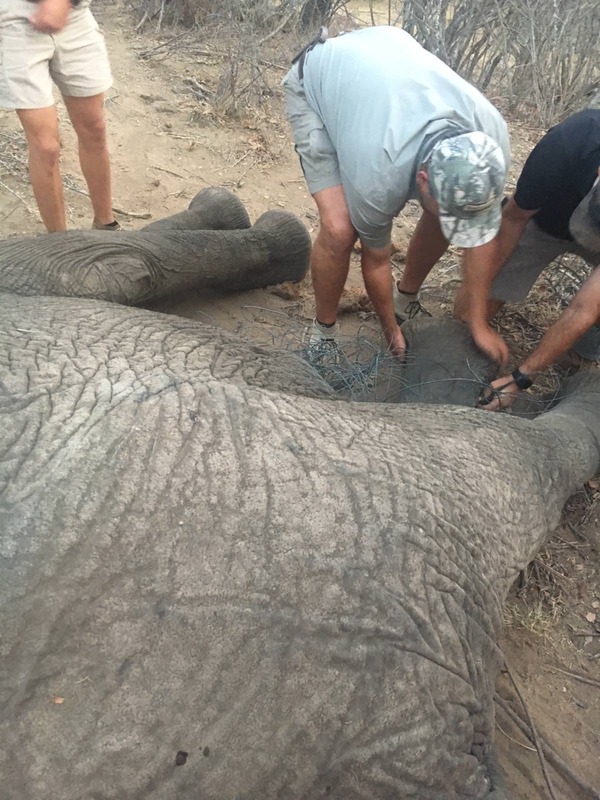 It took a large team of rangers to manoeuvre the elephant to remove the wire from his legs, it was almost dark and everyone had to get involved, it was a real team effort. It was a relief to see the elephant bull comfortably get up and walk as he recover from the anaesthetic. Day nine started with a call out to remove a snare from another wild dog. Once again, this was a lengthy procedure involving a large team to find the location of the wild dog pack. Removing the snare was relatively simple and thankfully no harm was done. Listening to the host family and Dr Rogers discuss the difficulties farmers face with wild dogs and the conflict between conservation and farming was educational and definitely very important to understand, particularly having seen two wild dogs caught in snares. At the practice we had two of the previously treated cheetah cubs return with new fractures and check ups on previous fractures. The remainder of the day involved watching small animal cases including a mass removal from a dog. My final day was brilliant. There were 10 buffalo bulls being relocated and therefore had to be TB tested. The allocated bulls were in a boma, however, some had escaped and needed to be located. We were invited to go out and try and find these buffalo, unfortunately they had scattered all over the reserve, flattened fences and mixed with other herds making it difficult to return them. Working in such close proximity to these young bulls quickly explained why buffalo are considered extremely dangerous and subsequently classed as one of Africa’s Big Five. After a couple of hours of TB testing some buffalo became quickly agitated. Buffalo don’t mock charge so it was important we were on watch whilst the actual TB testing took place. One buffalo did charge straight into the tractor and fortunately didn’t hurt anyone, that was a real eye opener to the strength and speed of a buffalo. On my weekends I had a couple of rides in the Bush on the host family’s horses, seeing wild wildebeest, giraffe and zebra on horseback. I spent the most fantastic day on a safari in the Kruger National Park, alongside visiting the world famous Jessica the Hippo and the rehabilitation centre Moholoholo. 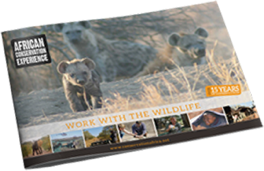 This experience was amazing, I would highly recommend it to anyone, not only to those interested in veterinary but anyone who enjoys travelling and an adventure, wants to learn or just to see South Africa’s wildlife close up with a true feeling of the country.